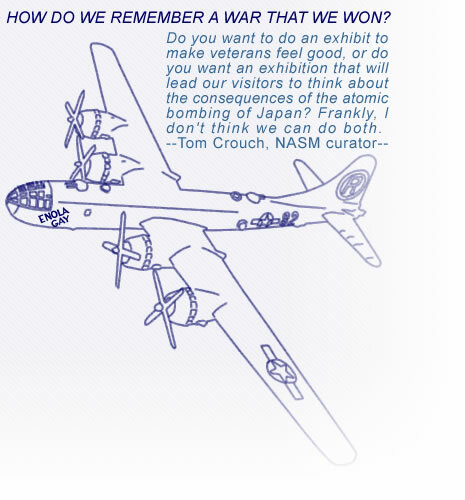 The Smithsonian proposal to mark this important anniversary as a "crossroads" -- consonant with a new Smithsonian philosophy of museumship by Secretary Robert McCormick Adams and NASM Director Martin Harwit -- is unsuccessfully questioned privately by the Air Force Association, led by John T. Correll. Organized opposition, now public -- including the American Legion, members of Congress, and World War II veterans of all stripes -- to the direction of the Smithsonian exhibit mounts, forcing several more drafts, none of which satisfies the critics. A group of historians vigorously defend the museum, but a dispute over the number of lives saved by dropping the bomb dooms negotiations for an exhibit acceptable to the critics, and new Smithsonian Secretary Michael Heyman admits the museum made a mistake, cancels the exhibit, and plans a new, uncontroversial one. In the period before the new exhibit opens, the group of historians calls for national teach-ins in protest, Smithsonian damage control includes a conference on museums in a democratic society at the University of Michigan, and Martin Harwit resigns just before two days of hearings begin in the Senate. Retrospects and reflections on the controversy following the opening of the new exhibit. The controversy over how the Enola Gay should represent history gradually becomes history itself. Yet the same controversy flares anew briefly in 2003 when the plane is moved to a permanent home in the new National Air and Space Museum at Dulles Airport.